Finding fresh and unique teen gifts or presents for men of all ages can be quite tricky. But a trend seems to gather a lot of popularity these days. More and more men like to wear necklace pendants which have a deep meaning for them or that reflect their personality. And you can find plenty of cool models on the market for the man in your life, like a modern and high-quality dragon necklace or one with his initials. The greatest part is that these products are ideal gifts for any occasion. This necklace could be a universal gift since it has a classic style and it is made of a material that can be equally liked by men from all social backgrounds. The Italian product is an authentic piece, with a Figaro design plated with rhodium and with a lobster-claw clasp. You can offer the appealing item to someone with origins in Italy, to remind him of home, or as a birthday gift to someone who enjoys collecting premium necklaces. It is an option that you can’t go wrong with. You should also know that it doesn’t lose its shine in time and that it is rust-free. All Star Wars fans will adore you if you offer them this piece. It comes in black, and it is ion-plated, which makes it ideal for daily use without getting dull. The highlight of the model is the high-quality pendant that is 3D printed in the shape of Darth Vader. It is safe to be worn directly on your skin since the material is inert and it won’t make your skin develop rashes or color it even if the product is black. To attach it around your neck, you can make use of its lobster-claw clasp. If you have a religious father, brother or friend, and you want to offer him a thoughtful gift, this model should be appropriate. Just as most user-friendly products, this features a lobster-claw clasp made from a strong metal that doesn’t break into pieces. The chain and the cross are made of tarnish-free surgical steel, and it features six genuine round diamonds in the center of the pendant, which add a lot of value. This transforms it into a classic piece that can be worn for a diverse palette of events. It also a nice weight to it, so it will remind you that your guardian is always with you. If you are about to attend a Bar Mitzvah, and you are not sure what gift to buy, the pendant can be a great and satisfying last minute gift idea. It is handcrafted in the USA, and it features the Star of David. It is rhodium-plated, for a never-ending shine, and its craftsmanship is exquisite. It looks expensive, although the price itself is quite low. The chain is large enough for most neck sizes, and it is made of steel, ideal for daily use. It can become a family heirloom since it is rust-resistant and the manufacturer guarantees a long life. An official Star Wars licensed product like this, which has a fresh design and a premium vibe, is hard to come by. That’s why you should check out its features. The Rebel Alliance logo pendant logo is made of surgical steel for durability, and it has a silver color for a touch of class. The fact that it has a timeless style makes it suitable to be offered as a gift to anyone. And since you have the official gift box included, it means you will save time and money by not having to wrap it yourself. The lobster-claw clasp makes it easy to put on. This is a unique gift for someone who has a particular sense of style. To sum it up in a sentence – it is badass. The pendant looks like a gothic dragon tooth, and it could be fit for a rocker or someone with an eclectic personality. It is made of titanium steel, and it comes with a branded gift box. Moreover, the material is non-allergic, and it won’t fade in time since it is highly polished. For those who can’t stand nickel, this model is nickel-free. It’s a manly piece and can go well with any costume or shirt. Jewelry for men has a different connotation than the type usually worn by women. Guys don’t need a piece that becomes the center of the outfit, as gals do. They need jewelry that is understated, a bit rough and has a certain significance. If you are interested in finding the best necklaces for men, be aware of the rules you need to follow. We know that finding the right piece of jewelry for a man is not an easy task. That is why we come to the rescue and want to offer you the best actionable information you can find. First things first, you should know that men look good wearing necklaces, just like women do. However, you need to learn a few things about men’s fashion, while you’re on the lookout for a male necklace. 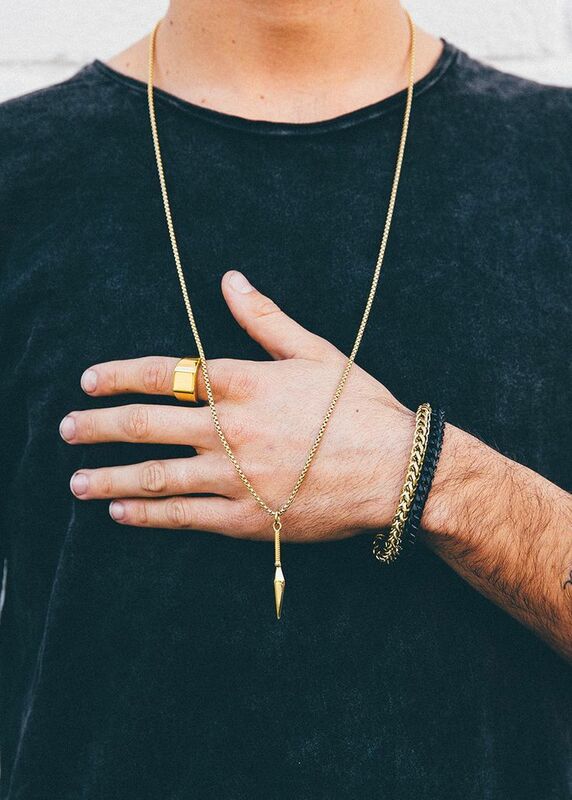 Be aware that male jewelry must complement the rest of the outfit, without overwhelming it. We will go into more details below. Right now, what we want to tell you is that you can rest assured that you will find the most beautiful piece for the special guy in your life, for your father, or your brother. Heed the advice below, and you will be able to buy a beautiful gift. There are different considerations to keep in mind when you are shopping for men’s jewelry. When people search for necklaces for girlfriends, they may look for something fancy, shiny, and brand new. But men are different when it comes to necklaces, and you might even have to think the complete opposite. Men do not need flashy jewelry. When you see celebrities wearing too much bling, that is usually considered gaudy and out of place. Normal people would not get away with the same antics rap stars pull, so unless the man you want to offer a necklace as a gift is a big fan of 50 Cent, you will not make the right choice by going for bling. What you should focus on is a natural look. The necklace you choose for your guy must look as if it has already been worn for many years. Family heirlooms are much appreciated for this reason. However, if you want to offer such a gift, you would be hard pressed to find a vintage piece at a reasonable price. That leaves you with the other options available. The men’s necklace reviews available to read online might give you a few ideas. What you should keep in mind as a general rule is that such a necklace should look a little rough around the edges, and overall have a more rugged look. That will lend it the natural appearance we are talking about. One of the most important aspects to consider is what kind of material you want the chain to be made of. If you opt for precious metals, make sure that the chain will be very slim, as it will draw attention. This kind of chain works best with outfits that are not fancy. If you want something more rugged, a steel ball chain is another option. It will work best with a long pendant, and its most significant advantage is its minimalist style. For men who don’t like standing out, this is a practical, wise choice. Next, you should consider leather. For men who aim for a relaxed look, it is the ideal alternative to metals of all kinds. Necklaces with leather thongs work like a charm with casual wear. There are many cool-looking necklaces for men that come with leather thongs, and they are often reasonably priced. If the man you want to purchase a necklace for is a young adult or a teenager, a more outdoorsy looking item may be a better choice. Hemp is used for chokers, and surfer models are made this way. Rope cord is also common for such necklaces, and a material preferred by people who like going camping. The last choice to be mentioned here is a ribbon or a colored chain made from cloth. Be aware that such materials are preferred only for medals, and they are not suitable for necklaces, as a general rule. If you look around at the necklaces for guys available for sale, you will notice that the chain comes in different length. That means that there’s another aspect to consider when shopping for the best male necklaces. Short chains are used for chokers, and they are very versatile. Except for formal wear such as business suits, this length is appropriate for almost any kind of outfit. Mid-length necklaces are a good option for metal items. The links will be visible on an open shirt, so they don’t need a pendant to come with them. By no means should you attach a pendant to this kind of chain. If you like pendants, and this is an option you want to jot down on your list, go for a long chain. Typically, guys should wear the pendant under the shirt, and make it visible only when they wear a very casual attire. When you’re looking for the coolest items, you need to focus on style, too. Depending on the recipient of your gift, you have various styles to choose from. Dog tags are considered a kind of cool style, but make sure you are not off the mark. Some people think that wearing such a necklace when you’re not part of the military, an insult to the servicemen on the battlefield around the world. A simple chain is always the right choice. Pick the right material, as indicated earlier, and the right length, and you will not go wrong. Pendants are an option, and they work with chains, too, but an option you should not overlook is a leather thong. As you can see, there are plenty of choices available. Always bear in mind the preferences of the person for which you are buying the necklace. That is the surest way to purchase the right gift for them.